Hair loss in women can be due to a number of reasons. Even the more common causes can make for a long list. Genetic factors or female pattern baldness, post-pregnancy and stress. Diet, hormonal imbalances, illness, and medical operations, chemo, for example, traction, chemical damage and on occasions self-induced hair loss. 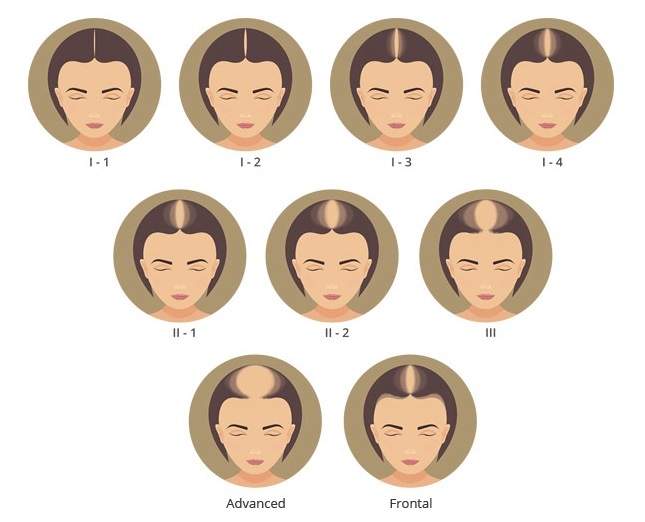 The pattern of hair loss is different from male pattern hair loss. As a result, there is a special scale to categorise the patterns. The Ludwig Scale is used. The hairline tends to remain intact. But with a diffused hair loss pattern behind. On occasions, the thinning is concentrated in a specific area. Often the parting. Due to the variety of hair loss causes a blood test is generally required before any diagnosis is given. Unless the cause is relatively obvious. Blood work may show up reasons for hair loss. As a result, that could determine what type of treatment prescribed. Also, discount other treatments straight away. All these aspects need to be discussed at a consultation, in person or online. A hair transplant may be a viable course of treatment. Once any contraindications have been ruled out. Hair can be taken from around the back and sides of the head. Then distributed over the area of hair thinning. As with any hair transplant, a little hair length will give the best look of fullness. This is generally not a problem for women. Who often has a longer hairstyle anyway. In most cases, either the hair transplant techniques can be used. On the right candidate. The individual´s hair characteristics and goals need to be considered before deciding on either the FUT or FUE hair transplant techniques.